Oh no, here they go again; Sonic trying to tread on Mario’s toes and milk a little bit of his success by pushing in on his turf. It wouldn’t be the first, and most certainly won’t be the last. But I’m sure the blue hedgehog hears enough about being a faker by a certain black hedgehog — so let’s take a step back to look at the latest game featuring the blue blur with a more open mind. In other words, let’s not question why he’s racing in a car; let's just look at the game. Like most racers, there are different racing modes ranging from online play to a single player career mode that has grand prixs and a world tour campaign. Like many games, you’ll have to play through the single player to unlock some of the additional features. Of course, I picked Tails most of the time as he is my favorite character. Forgive me for the bias. Now let me be the first to admit, I’m no racing game connoisseur. My brother loved them, but after one grows up and moves out I grew quite distant from the genre. Saying that this is probably the first racing game I’ve used my PC to play, and it certainly showed during my first race. Certainly, I wasn’t aware that this game had a predecessor until after I had played this one. Like any “Real Gamer” (TM), I did not read the instructions before plopping myself into the driver seat. So the first task was finding the key to accelerate, because the game does not hold you hand at all. I tried the W key first (due to FPS syndrome) just to end up flipping haphazardly; nope, that’s the stunt key. Then I tried the spacebar which seemed the second logical choice – hilariously, I couldn’t have been more wrong as Tails looked over his shoulder as if to glare at me as the vehicle moved in reverse. After a minute more of trial and error (and making the poor fox look more like Big the Cat with a car), I found the key: Left Shift. Who knew? However, through this mistake – and my dead last finish – I learned a lot of important things about this game. For one, it does not use “rubber band” AI. This can be a good thing and a bad thing depending on one’s personal preferences. They aren’t going to slow down just because you’re sucking and they aren’t going to catch up to you just because you’re doing splendidly. It’s up to you to turn up their difficulty if things are getting too soft. In the campaign mode you’re encouraged to do this to earn more stars, helping you unlock stuff. Secondly, a lost race does not mean lost time or effort. Rage-quitting would not be advised. Even if you lose, you earn points by doing things well – such as driving stunts or item accuracy – which level up your chosen driver, allowing you to tweak their stats with pre-set modifications. These are typically better than the default setup, where each character usually has a glaring strength and an obvious weakness. For example, Tails’ strength by default is his handling, at 5 out of 6, while his speed is only a 2 out of 6. However, I use the term strength lightly, as I found myself doing terribly. In his default setting Tails was particularly sensitive and tight. While this could lead to pulling off some wild maneuvers for the more experienced, for me it meant constantly ramming into things and shooting off the track when making what should be smaller corrections around the curves. Probably for using the keyboard instead of a joypad. After some experience I was able to loosen Tails up with the “balanced” mod which dropped the handling one point for one point of speed. This made for a more enjoyable experience for both of us. I noticed I started to win a lot more races and was bumping into things I shouldn’t a whole lot less; giving the poor fox less headaches. The “blowfish” is the banana peel. The “drone” is a red koopa shell; just be sure not to use them too much or the U.S. Congress might have a fit about it being overpowered. The “rocket” is the green turtle shell. The “boost” is the mushroom. That’s not to say that this game doesn’t have it’s own unique repertoire of goodies. There’s the “hot rod”, which is like a boost on steroids which you control that ends with a fiery explosion when you stop using it, damaging everyone around you. However, if you let the boost go too long you’ll end up being the one coming to a dead halt. 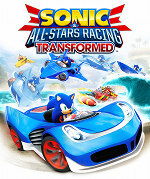 Then there’s All-Star mode, which is similar to the star item from Mario Kart, except that the character will transform into something unique that they can use to push ahead. Tails, for instance, becomes a biplane with two wing buddies. His speed increases a bit, but he can also hit the 'use' key to have the planes around him fire missile barrages ahead of him. From what I’ve seen the other characters’ All-Star modes are similar in behavior while different in appearance. Though there are these items, the last thing that makes this game much different from Mario Kart is that they don’t matter as much. This game’s main draw is that you are given boosts for performing stunts, performing combos, doing long drifts. It is very much a game of momentum. When a player gets it, they may not lose it – and if they don’t, they’re probably going to win. There are no blue turtle shells to make your younger sibling, or your grandmother, feel better by giving them something to alleviate the stress of being in last place. The “swarm” puts a horde of large bees in front of the person in first, but that is at least avoidable and can also damage people close behind them, including the user. If two players of equal skill are playing, the items will matter more, since they’ll be close enough to one another for them to be effective. This seems like it’d make for a balanced multiplayer, but there is one major drawback which could quickly unbalance it. Though I haven’t played it yet, I can tell that those who have unlocked mods for the characters will have an advantage. The higher they’re leveled, the more options they’ll have to tip the scales in their favor. Even worse, each character is a different level – so if you spent all your time playing Tails, you better hope you opponent doesn’t pick him first, or you’ll be stuck with a character you haven’t leveled up. One should spread out their eggs. One nice touch is that you earn coins while racing, which you can use while waiting on the loading screen before the race to play slots. If you line up three items of a kind, you’ll get a bonus that applies for that race. It’s a nice way to keep one busy during load times. Lastly we’ll talk about the tracks. There are two “types”: those which change from lap to lap, and those that remain static. I personally find the transforming tracks a more amazing concept then the transforming vehicles— which I forgot to mention. You can race as a car, a boat, or a plane: similar to Diddy Kong Racing for the N64. However, unlike DKR, you change between the three forms depending on the need for the track. Rarely do you have a choice to take one or another in parallel paths, more often it’s just part of the ride, which is why I don’t focus on this particular gimmick too much. While there might not be much say in what you ride or when you ride it, there is an appropriately different feel for each. The transforming tracks though, I really enjoy. One is a floating island whose skies are filled with floating pirate ships. The first lap is relatively peaceful, and gives you a look at the quiet scene; just another day at the races. Then on the second lap they start to open fire upon the track (or terribly missing the other ships), breaking bridges and busting the land. By the third lap there’s so little track left that you’re forced to make the last rounds entirely by air. There’s another in a canyon where you do the first lap on the cliffs and bridges by car, the second by boat along the rapids, and the third by air through the chasm. Each gives a different perspective of the same area with its own unique tricks and hazards. Of the tracks I have played so far, each has its own unique feel. They vary in challenge; some tracks require tight precision, while others give you more freedom to move about and focus on the racers as opposed to environmental hazards. The most punishing track was an urban setting which had you jumping across rooftops – if your angle was off, you’d swiftly fall prey to the long plummet to the streets below. None of the tracks I’ve been on have had that feeling of being a similar track with a fresh coat of paint, which tends to plague racers. However, I haven’t unlocked them all yet, so it’s too soon to tell. Considering the numerous ones I have seen, it’s a good sign that they have the right idea of giving the tracks personality in the layout and not just the aesthetics. It’s fun to play, it’s smooth, and it has good game feel. It’s also a good price for a relatively new game: about $30 on Steam. If you enjoy Mario Kart, or maybe if you didn’t like it because you felt it was all about getting lucky with the items and not so much the time spent practicing tracks, you’ll not want to pass up this racer. To end on a sour note: some of the voice acting makes me cringe. Tails is okay. But Shadow and the TF2 characters of Heavy and Spy are just... Mon Dieu! Words cannot describe the terribleness.